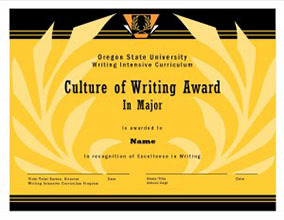 WIC and participating units strive to foster a commitment to excellence in undergraduate student writing and recognize the value of writing across the disciplines with the annual Culture of Writing Awards. 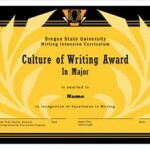 Participation in the Culture of Writing Awards has thrived since 2006 as students earn recognition and cash awards through either individual or team writing projects. This year, participation continues to be strong. WIC would like to thank all participating units for their continued desire to recognize and reward outstanding student writing.